There is growing evidence that this applies not only to inequality between people, with a widening gap between a few very rich individuals and all others, but also to regional differences within and across states. Rodriguez-Pose (2018) argued that regions across the world seeing declines are those that breed political tension and rising populism, for example in the US, the UK, France, Germany, and elsewhere. In a new book and a recent paper we show the long-run origins of this, tracing the development of 173 European regions (NUTS 2) from 1900 until today (Rosés and Wolf 2018, Rosés and Wolf forthcoming). The results are stunningly similar to those from Piketty (2014) and others on personal inequality – we find a U-shaped development of regional inequality with a turning point around 1980. 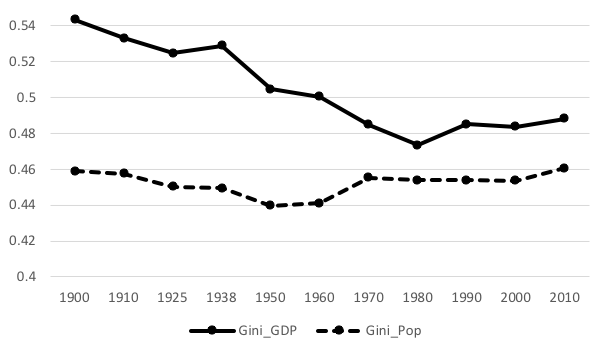 Figure 1 shows the distribution of GDP (in constant prices and at purchasing power parity) and population across regions over time, measured as Gini coefficients. Source: Rosés and Wolf (2018). Since 1900, regions have been becoming more similar, only interrupted during the interwar period. This process of convergence gained pace after 1945, and was observed in other parts of the world as well (Barro and Sala-i-Martin 1992). A driving forces behind this was structural change, where regions previously dominated by agriculture were catching up in terms of both industrial and service employment. This was facilitated by the integration of markets for goods, capital, and labour, and the spread of technology including electrification. Convergence took place between states and between regions within states. 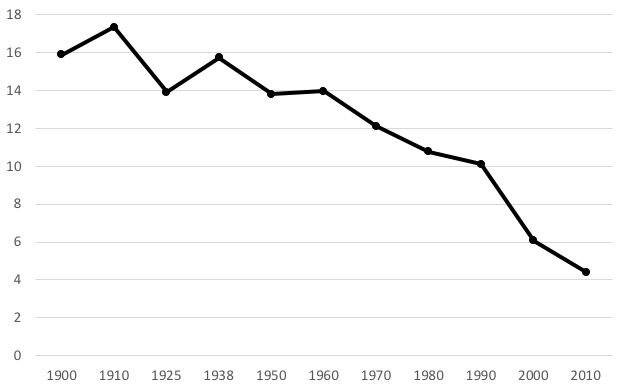 However, convergence weakened in the 1970s, and in Europe it largely stopped thereafter. 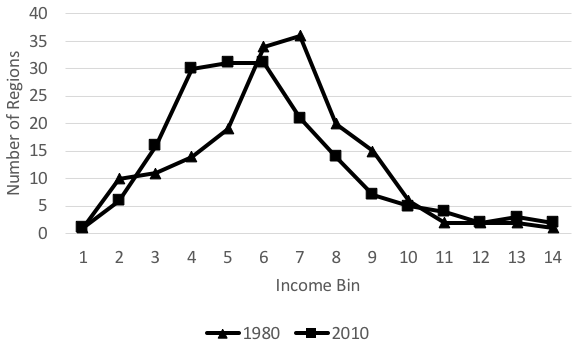 Figures 2a and 2b show the changing income distribution over time. For each year, we group all 173 sample regions into 14 equally sized income categories (‘bins’) in terms of GDP per capita (again in constant prices and at purchasing power parity), from poorest at the left to richest at the right. We see that in 1900 most regions were in the lower categories and few in the highest ones. Over time between 1900, 1950, and 1980, this shifts to the right, with more and more regions showing a GDP per capita around the median. Especially strong was the move to the centre between 1950 and 1980 (Figure 2a). But the process was reversed in 1980, as shown in Figure 2b. In relative terms, some regions are doing much better than others, and the entire distribution is shifted back to the left. Within all this change, there is some stability but also a truly remarkable reversal of fortune. A few regions have done well in 1900 and they are still among the most dynamic parts of Europe today, notably all capital regions such as Île de France (FR10) around Paris, Luxembourg (LU00), Stockholm (SE11) and Brabant (BE10 and BE24). 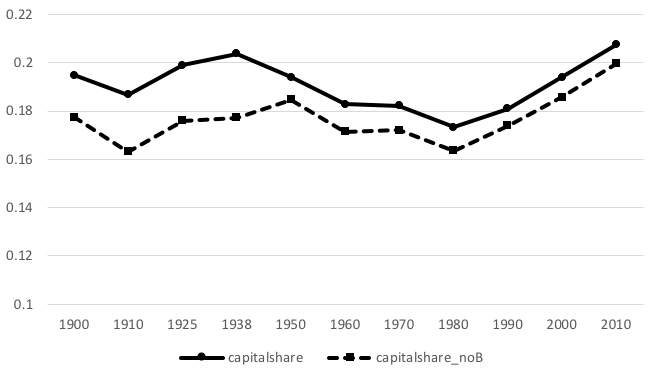 Figure 3 shows the share of capital regions in total GDP of our sample over the last century. From 1980 onwards, capital regions in Europe were gaining weight. This is not driven by the rather special development in Germany and Berlin (nor any of our other observations, which we tested for). In contrast to this stability of capital regions, there is a lot of variety between Europe’s industrial regions. Some of the old industrial regions in Europe managed to maintain their position and industrial wealth, including Catalonia (ES51), Lombardy (ITC4), and Northern Württemberg around Stuttgart (DE11). These regions have always been less dependent on coal resources and heavy industry, and more specialised in machinery and vehicle production. Instead, some formerly rich regions have dramatically fallen behind. A striking example is the region of Hainaut in Belgium (BE32), which was among the richest parts of Europe in 1900. It is among the poorest regions in the EU today. If we rank all regions in terms of GDP per capita for 1900 and 2010, Hainaut has declined from rank 7 out of 173 in 1900 to rank 153 in 2010. Some other regions in Europe share this fate, including all other parts of Wallonia, Wales in the UK, Haute-Normandie (FR23) and Nord-Pas-de Calais (FR30) in Northern France, and the Saxon regions in Eastern Germany. What happened? We call these regions the ‘industrial losers’, because all of them were characterised by very high shares of industry, especially heavy industry and mining, in total regional employment. Empirically, proximity to coalfields was an advantage for economic development in 1900, but turned into a burden after the 1960s. Overall, the share of industry in total employment peaked around 1970 and started to decline thereafter. Former centres of modernisation started to fall behind, in terms of average income but also in terms of population, resulting in a decline in property prices and wealth in these regions. The driving force behind all this was what Baldwin (2016) called the ‘second unbundling’ – the combination of declining trade costs (for example due to containerisation), declining communication costs, and rising real wages in the 1970s, spurred a new global division of labour. Europe (and the US, Japan, and other OECD countries) lost industrial employment to developing countries, while gaining employment in tradable services. For example, the share of financial services in value added soared. This in turn benefitted regions that hosted the headquarters of large banks, insurance companies, and the stock exchange – capital regions, as a rule. Another perspective on this is spatial coherence, or the question of how similar neighbouring regions are to each other in terms of income levels. A relatively simple way to capture this is Moran’s I, shown in Figure 4. Applied to GDP per capita as our variable of interest, this statistic measures the sum of differences between all pairs of regions in terms of deviations from average GDP per capita, weighted by their distances. For large samples, the expected value under the null hypothesis of no spatial autocorrelation across regions approaches zero. If this measure is large (compared to the expected value) we say that a region shows ‘positive spatial autocorrelation’, indicating that nearby regions tend to have similar values of GDP per capita. We show a standardised version of this (the so-called z-scores). There seems to be a growing spatial disconnect, with a long-run trend that recently intensified. Some regions are growing dynamically, while others are stagnating and falling behind. There are islands of prosperity in a sea of stagnation. Should we be worried about the return of regional inequality? After all, we should care about people, not about regions as such. But the rapid decay of formerly prosperous parts of Europe can undermine social peace and political stability. In those regions, it is not only the poor who lose but the middle-income groups that are faced with a choice between migration (at the risk of losing their identity) and staying (at the risk of further decline). Or, put differently, between ‘exit’ and ‘voice’. Given our new evidence, we see that this is part of a very broad and long-run change, and very likely driven by the same forces that account for the rise in personal income inequality. Both personal and regional inequality need to be addressed, or else we will observe more of a populist backlash. 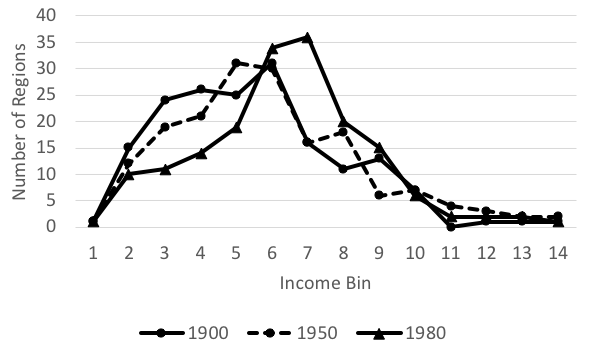 Atkinson, A (2007), “The distribution of top incomes in the United Kingdom 1908-2000”, in A Atkinson and T Piketty (eds), Top Incomes over the Twentieth Century. A Contrast Between Continental European and English-Speaking Countries, Oxford University Press, Chapter 4. Baldwin, R (2016), The Great Convergence, Harvard University Press. Barro, R J and X Sala-i-Martin (1992), “Convergence”, Journal of Political Economy 100(2): 223–251. Milanovic, B (2016), Global Inequality: A New Approach for the Age of Globalization, Harvard University Press. Piketty, T (2014), Capital in the 21st century, Harvard University Press. Rosés, J R and N Wolf (2018), “Regional economic development in Europe, 1900-2010: a description of the patterns ”, CEPR Discussion Paper No. 12749. Rosés, J R and N Wolf (forthcoming), The Economic Development of Europe's Regions: A Quantitative History Since 1900, Routledge Explorations in Economic History, Routledge. Rodríguez-Pose, A (2018), "The revenge of the places that don’t matter (and what to do about it)", Cambridge Journal of Regions, Economy and Society 11(1): forthcoming.